Dear Readers, Important Practice Aptitude Questions for Upcoming Exams was given here with Solutions. 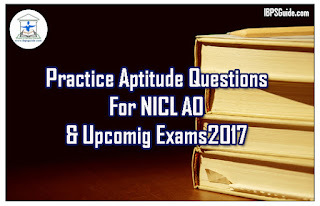 Aspirants those who are preparing for the Bank Examination and other Competitive Examination can use this. 1). In a mixture of 60 L the ratio of acid and water is 2: 1. If the ratio of acid and water is to be 1:2, then what is the amount of water (in litres) to be added to the mixture? 2). In what proportion must grocer mix wheat at Rs.2.04 per kg and Rs. 2.88 per kg so as to make a mixture of worth Rs. 2.52 per kg? 3). A container has 40 litres of wine. From this container, 4 litres of wine is taken out and replaced with water. This process is repeated two more times. What will be the final quantity of water (in litres) in the container? 4). Vikram has some cows and some ducks. If the total number of heads is 90 and the total number of feet is 248, what is the total number of cows? 5). An alloy of zinc and tin contains 35% of zinc by weight. What quantity of zinc must be added to 400 lb of this alloy such that there is 60% of zinc by weight in the final mixture? 6). When the digits of a two-digit number are interchanged, the number obtained is less than the original number by 36. What is the original number if the difference of the two digits is 4? 7). The product of two successive numbers is 3422. Which is the smaller of the two numbers? 8). The sum of five consecutive even numbers is 380. What is the sum of largest and smallest number? 9). Out of three given numbers, the first number is twice the second and thrice the third. If the average of these three numbers is 154, then what is the difference between the first and the third numbers? 10). If five times of a positive integer is equal to three less than twice the square of that number than find the number? ∴ final Qty of water = 40 – 29.16 = 10.84 L.
All are satisfying the above condition. So cannot be determined. ∴ the smallest number is 58. Hence, required positive integer is 3. Do you feel that you are weak in English Section?